When we originally acquired Product Customizer from another developer, it served only a very particular kind of store well: stores that wanted to add one-off customization options to some of their products, such as gathering initials for monogramming. The app’s structure was brittle and didn’t let us add new features or make improvements the way we wanted to. As a result, we essentially started from scratch to build an entirely new app that would support several kinds of merchants and stores both large and small. Our re-built Product Customizer adds tons of new features, improves performance and scalability drastically, embeds the app in your Shopify dashboard, and makes a Pro tier available with more advanced features. 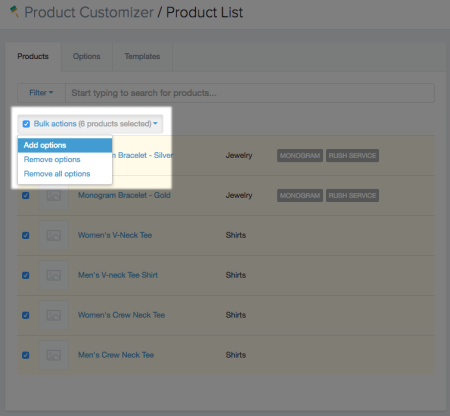 Let’s start with what every current Product Customizer user will see. Every single merchant using Product Customizer is going to have a ton of great upgrades available, and we’ll start rolling out this changes to all merchants this week! First, you’ll notice that Product Customizer is now an embedded app. This means that you can access the app by going to Apps > Product Customizer in your Shopify dashboard, and you’ll be able to start using the app immediately from here. No reason to visit an external site to manage your options any longer! Your product list is will be more intuitive to navigate, and will show you the product name, thumbnail image, product type, and options applied at a glance. You can now search for products to make finding products and applying options far easier and faster, and you’ll also be able to view any options or saved templates you’ve added. The biggest change we’ve made to the app is to completely re-think the way options are managed. While tying options to products in a 1-to-1 ratio works for adding options to a small product catalog, it does not work well for merchants that want to add the options to several, maybe even hundreds, of products. It also makes managing and updating those options or products in the future a monumental task. In our new and improved app, we’ve re-thought option management to remove that 1-to-1 ratio between options and products. Options are no longer created for a product. Instead, products use an option, which lets one or more products use an option that’s centrally managed. In your “Options” list, you’ll create parent options. You can deploy a parent option to one or more products once it’s created here. This is a fundamental shift in the way options are managed. 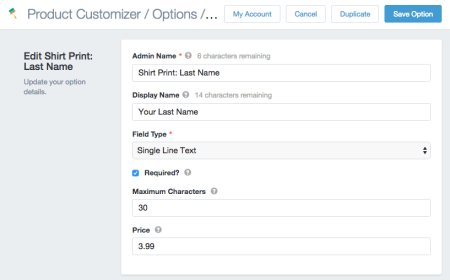 By letting you create a parent option that’s not tightly tied to one product, you can more easily add options to several products at once. More importantly, you can update this parent option in one place, and it will automatically be updated across any products that use it. This is a huge win for stores that use the same option on tens, hundreds, or thousands of products to drastically speed up managing options across an entire product catalog. Options also have a few minor improvements over the way they used to be created. Options used to have one “name” that was displayed to you and customers. Now we’ve split this into an admin name (shown to you in the admin), and a display name, which is entirely optional and can let you show a different label to your customers. As it stands right now, there are still some character limits imposed on these names, which is one thing we’ve promised many of you we’re working on fixing. We’re first migrating everyone over to the new app in stage 1, and once this is complete, we’ll do another update to the app’s structure to allow more flexibility in display names, along with a new “description” field for options. This is coming soon! One of the biggest pains in the older version of the app was managing dropdown-type options. You could add a lot of options in a dropdown, but if you wanted to change or reorder them, you had to delete them and re-enter them. 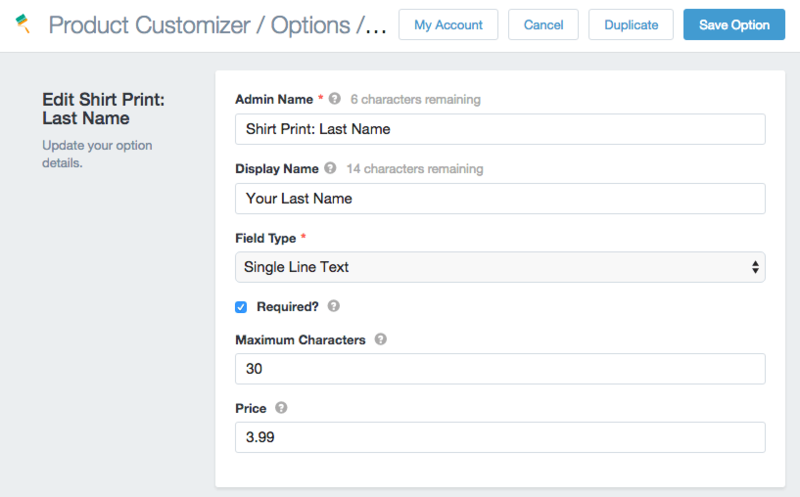 We’re now introducing the ability to re-order dropdown field options very easily! Any option you’ve added to a dropdown can be moved via “drag and drop” to change the display order very quickly. 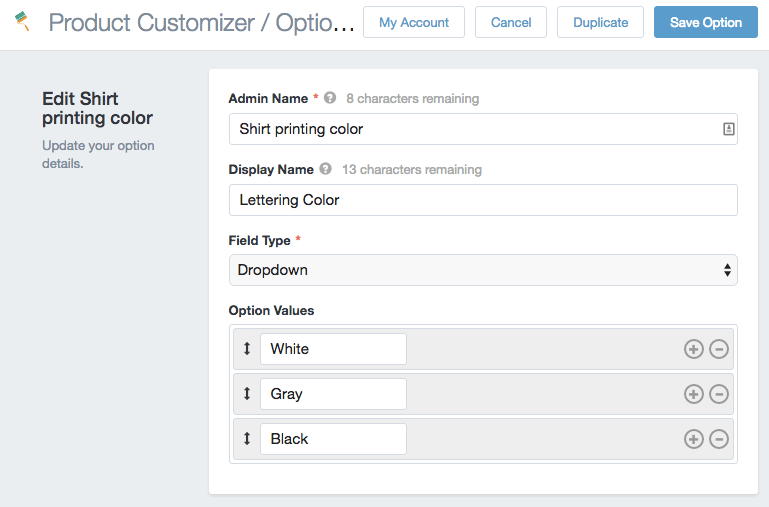 Saved sets have always been a useful feature of Product Customizer, as they let you save a set of options that you could then apply to other products. However, they were cumbersome to use because you couldn’t view a list of all saved sets, see which options were in a saved set, edit saved sets, or apply more than one saved set to a product. We’ve taken what was good about saved sets and rolled them into Templates, while removing a lot of these annoyances. 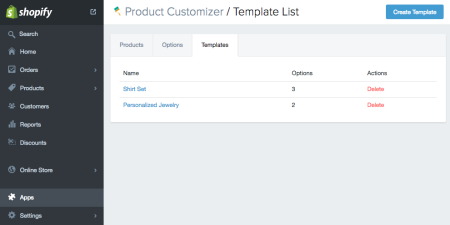 You can now view a list of all Templates for your store, and add new templates. This lets you save sets of options commonly used together. For example, font choices and monogramming text inputs can be saved as a “monogramming set”. The improvements come into managing these templates. You can view all options for a template, add or remove options, and re-order options within a template. 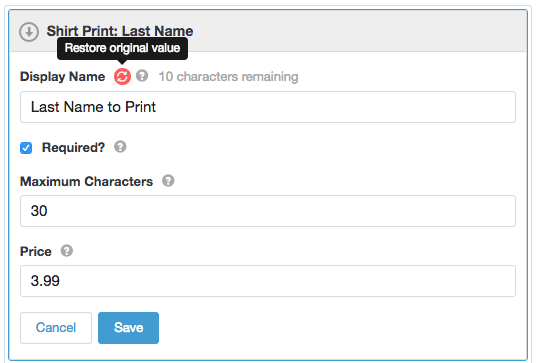 Since templates are just groups of parent options, you can also apply multiple templates to a product now. As these are essentially a “quick add” for options, they’re more flexible than they’ve ever been. While we’ve tried to make options a lot more manageable for large stores, we’ve kept the features that small stores love about Product Customizer, too! 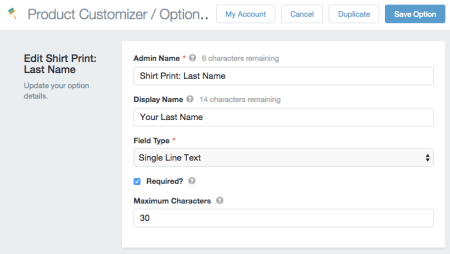 What’s always been great about Product Customizer is that stores could get started really quickly with adding the options they needed, and each product’s options were catered to that product. You can still make sure your options are displayed and used exactly as needed for your products, as they can be “customized” on a per-product basis. When I referred to your Options list, I referred to them as “parent options”. When you apply an option to a product, it becomes a “child option”. This means that, by default, that option will inherit all of its characteristics from the parent. You still add as many options as you want to for each product, and change the way they’re ordered. However, you can also override the parent option’s characteristics for a child. For example, you can customize the display name for this product, and this product only. When a child option overrides a parent, if I change that feature of the parent, the child option will still keep its own, overridden value. In this case, if the parent option’s display name changes, this child (the option as applied to this particular product) will still keep my manual setting. This will be especially helpful for things like dropdown options, where one choice may not be available for this product. You can remove that choice to override the options list, and it customizes the child option for this product alone. This lets you benefit from the flexibility of managing parent options in one place, while also having the fine-grained control over how an option is displayed for a product that you need. When you create options for your products, you’ll need a way to apply them to the right products. Chances are, certain products types will get the same options. In previous version of Product Customizer, you would have to go through pages and pages of products to apply options. No longer! 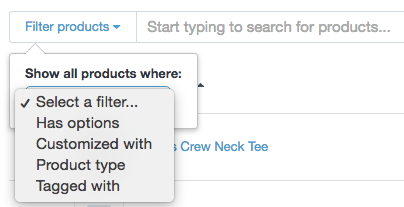 Product filtering lets you filter your product list so you only see the products you want to see, and apply the right options to these. 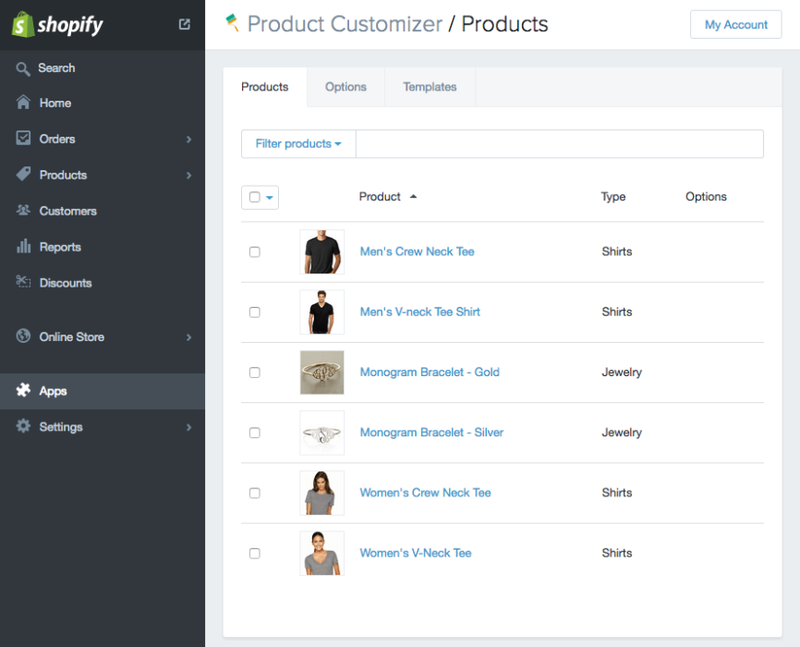 For example, you can filter your products by type to only see all “jewelry” or all “apparel” at one time so that you can easily apply your options. 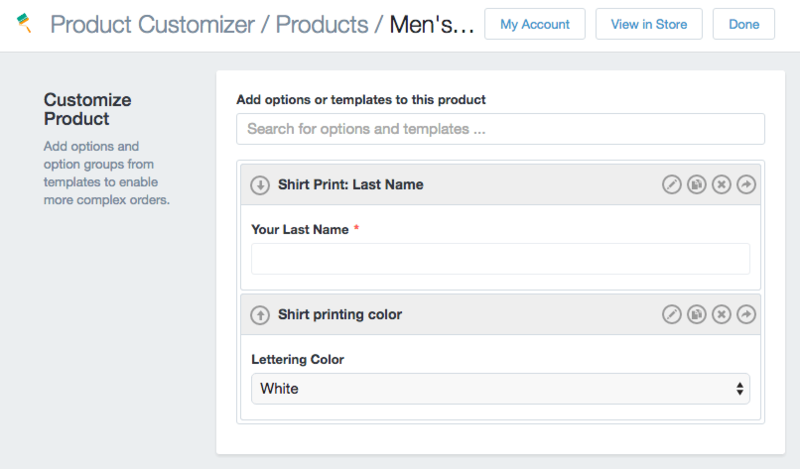 You can also filter products by whether or not they have Product Customizer options applied, which Product Customizer options are applied, and what Shopify tags the product has. Filtering is super useful for our next new feature: bulk actions. If you had a lot of products to customize with Product Customizer, saved sets used to be your best friend. However, it was still a huge pain to apply a saved set to your products by clicking on one product at a time, and could make the set up time for Product Customizer take hours. While templates (the new “saved sets”) may still be a great friend to you, we think bulk actions are going to make your life a lot easier, especially combined with filtering. Bulk actions let you apply one or more options to several products at once, apply a template to several products at once, or remove options from several products at once. 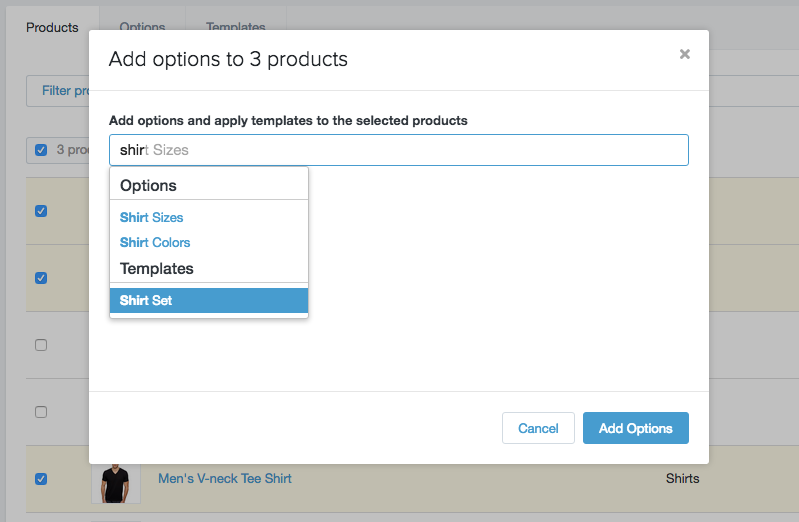 If you select “Add options”, you can add one or more options to your selected products, or you can apply a template of options to the products. This also lets you remove options by selecting which options to take away, or you can wipe out options by clicking “Remove all options”. Bulk actions will not delete your parent options or remove them; it simply lets you stop them from being applied to products. With any update to an app, we try to fix as many bugs as we can. With Product Customizer, since we knew we wanted to completely re-do the way the app was built, we hadn’t released as many bug fixes as we wanted to in recent months. As a result, there are also lots of bug fixes included in this update. First, the app properly supports special characters, such as Chinese characters. Previously, certain characters could cause some features to stop working, such as “required” fields. This silliness is now gone, and Product Customizer works with special character sets the way you expect it to. Option re-ordering was also less reliable that it should have been. If you re-ordered the way options were shown for a product, it was sometimes difficult to keep this (correct) order because you had to re-save all customizations. We’ve fixed option ordering for products in this release (and they’re automatically saved with every change), and will be rolling out an even better drag-and-drop ordering system for options on a product when we complete our app upgrades within the next couple of months. Finally, we used to use the browser’s “required” checks for fields. Well, Safari for some reason would tend to ignore this check, so we’d applied some manual workarounds in the old app that worked 95% of the time, but not always (depending on your theme). We’ve now changed the way we validate required fields so that our app handles them for your browser, making this more dependable. 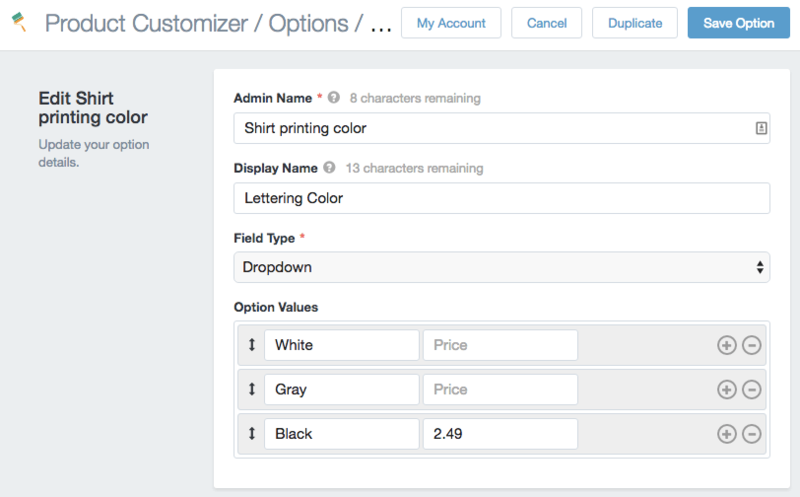 All Product Customizer users will benefit from these changes, and will be able to start using them immediately as we push the updates to their shops. However, rebuilding the app has let us add another tier of service, so if you want to upgrade to Product Customizer Pro, you can get even more cool features. There are some features that have been requested by some users, but that not everybody using the app wants or needs. These features make our support and maintenance far more expensive, so to implement them, we needed to raise the price of the app. However, we didn’t want to make the app too expensive for everyone to use; after all, if you don’t need these features, why should you pay for them? 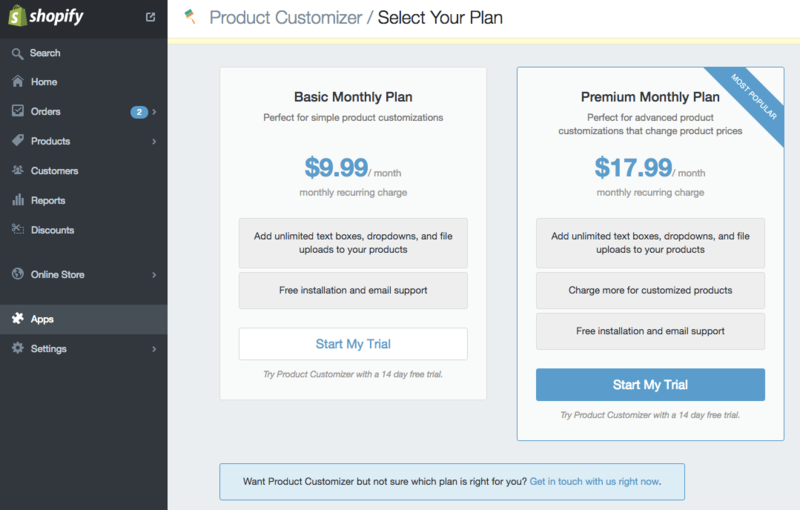 For merchants that need more features in Product Customizer, we’ve added a Pro tier plan. The Pro tier plan does not mean that regular users will stop getting improvements or new features. Instead, features that would be cost prohibitive to add to our regular app because they require more complicated installation from our team, more support, or different resources on our end, will be rolled into the more expensive plan, while features that require fewer resources on our end are available to both plans. This lets us offer advanced features to merchants that need them while keeping the app accessible to merchants who don’t. The first of these features is available already: option pricing. Our most popular of these “advanced” feature requests is the ability to add a cost per option. 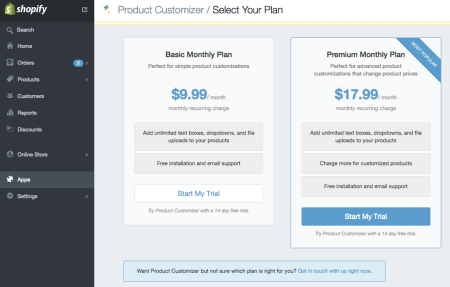 As such we’ve added two types of pricing per option into Product Customizer Pro. First, there are some options that will charge a fee based on completion; these are one-line text inputs, paragraph inputs, and file uploads. When a customer uploads a file or enters text, the option price will be added to the product’s price in Shopify. For dropdown options, we’ve added fees based on choice. These fees are added to the product’s price depending on which option is selected; you can add a fee for any or all options in a dropdown as needed. The fee will only be added to the product’s price when this choice is selected. For customers, they’ll see the fee next to the option label, or in the case of dropdowns, next to the choice that has the fee. 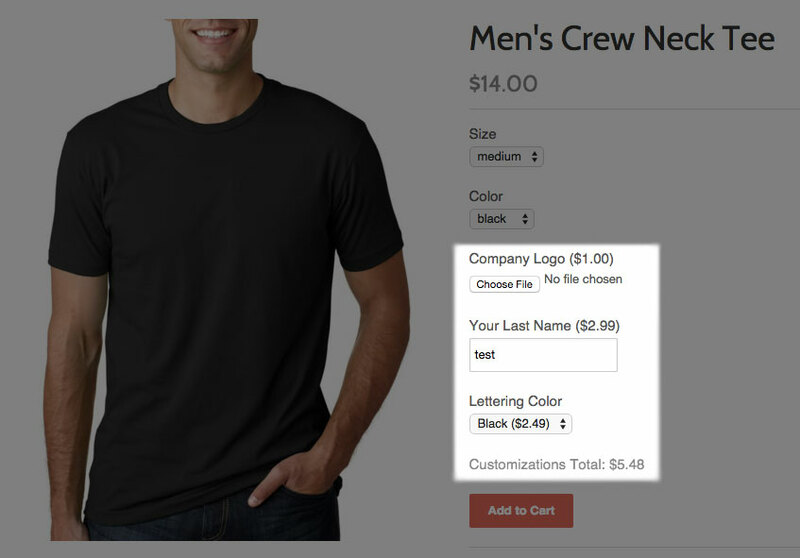 The total customization cost is also shown below options. This tier of the app requires a more complex installation procedure so that pricing displays correctly on the cart pages, in cart widgets, and also hides our “customization product” from search and collection archives. We’ve documented this with several Shopify themes already, but our team is always available for installation help. 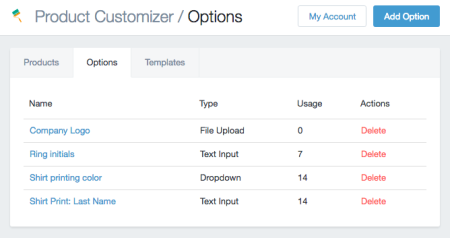 Product Customizer Pro users will also get priority customer service — questions or help requests from pro tier users are moved up to first in our queue. Want to upgrade to Pro? You can do so from the “My Account” button, displayed in the top-right throughout the app. We’re beyond excited to bring loads of improvements and features to all Product Customizer merchants, and we’re happy to offer advanced features like option pricing that some merchants need. If you’re already using Product Customizer, we’ll be upgrading your account this week. All options you already have will be converted to parent options in the app; if you have options across several products that are exactly the same, they’ll be converted into one parent option so they’re immediately easier for you to manage. Thanks again for being a part of our community and for choosing ShopStorm apps! I heard about such upgrade since I contacted Product Customizer Support talking about whether any way to load the dropdown value not using ajax. Seems the upgrade is mainly bringing the app work as embedded app plus product managment, while there is not many upgrade related to how to get product customizer work with ajax scenario, like showing product option in ajax popup model. Although there is some small issue happen 48hrs before the launch (one of my client’s website fail to load any options of product customizer), luckily the issue get fixed and followed by such upgrade announcement. Anyway, it sound promising so far and I look forward the app keep its improvement! Great work! We also apologize again for that slight issue; by most standards, this was a very smooth migration, but there are always some minor issues that crop up and we’re doing our best to make sure they don’t affect your orders. Hoping the new admin makes your life easier! Any idea when this will complete? Also, how long will stage 1 last (waiting for all your customers to be ported over to the new version)? Heya John, stag 1 completed for most stores within 1-2 hours. At a quick glance, I can see 70+ options and 90+ products customized within the import for your store. Could you have a look to see if this is right? If not, we can definitely take a deeper look — you can shoot an email to `help@shopstorm.com` thanks!